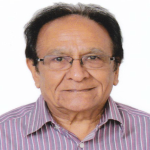 I was born in Nairobi to Indian immigrant parents who arrived Kenya in 1910, and started a successful family business of soap manufacturing and later diversified to an oil mill in Mombasa. My early education was at Ngara Primary and Secondary School before proceeding to India for University. I returned to Kenya in 1956 where I worked at Prudential Assurance Co Ltd, and soon after, married my lovely wife, also born in Nairobi, whose parents were also immigrants from India. Together, we were blessed with a daughter and son and four grandchildren. Due to the Kenya Government Africanisation policy at the time, I was made redundant in 1969 and was unable to acquire Kenya citizenship. As a British passport holder, I applied for a settlement voucher under the quota system and relocated to the UK on 13th May 1970, where I soon found an employment at the Guardian Royal Exchange as a Life Underwriter and subsequently as an Internal Auditor until my retirement in 1993. I am passionate about serving and giving back to the community, and have joined the leadership of some local and international charitable organizations that share these same values. For example, our Lohana Community in North London, Lions Club of London Finchley (LCI) and Maisha Trust Kinder Garten (based in Kibera slums) where I have raised funds for various projects that improve the livelihoods of the less advantaged in the community. I joined the Kenya Society Committee in 1990’s because of the fond memories and special relationship I have with Kenya. Membership to the Society gives me the pleasure to reconnect and contribute to the wonderful people of my birthplace. I am an active member and have attended all events organized by the Society, and particularly involved with the annual Kenya High Commissioners Garden party where I support the catering and hospitality service. I take great pride and joy in my family, and am pleased to see my children happily married and grandchildren flourishing in their respective areas of interest; one is reading Medicine at the University of Oxford. I still have my extended family in Kenya and do visit them annually.